Testing glues and silicones was the hardest part of building my tiny house since I did this when I was highly sensitive. It's difficult to extrapolate a small jar of dry glue to a house filled with it. (In retrospect I would have tested a much larger dry sample.) I smelled them wet because I got a clearer sign of their relative effects on me. Since I have not figured out a better way to test materials, that's all I'm working with. 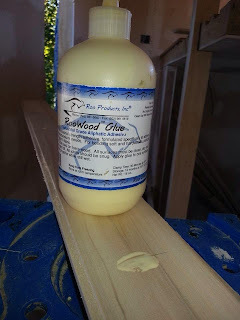 ECOS Wood glue - ECOS makes extremely tolerable products, and while I didn't get a chance to test this one. I would expect it to be quite good. Hide Glue is the most natural glue option for wood. It is a strong glue with no VOCs but it is not waterproof. You can mix it yourself from beads or flakes for the most natural option, or you can buy it ready made which does contain additives. While silicone itself is not toxic, chemicals are added to keep caulking in liquid form. For silicone caulk, look for 100% silicone, but each brand has different additives which affect people differently and offgass at different rate. The replacement silicones are much more tolerable, like EcoBond which does claim zero-VOC. They all smell when wet, and I tested them at 24 hours, 48 hours and one week. I would recommend getting a non-sensitive person to put them in jars and only testing them after they have dried. Note that caulks labeled bathroom or mildew resistant contain a mildewcide (except all of the EcoBond caulks including bathroom caulk). Currently GE I is mildewcide free, GE II contains a mildewcide and DAP makes an aquarium caulk that is free of mildewcides. Any caulk labeled aquarium safe is free of mildewcides. AFM Safecoat Caulk - Not the best when wet, not the best at 24 hours, but the best at one week. I used this in my bathroom. It comes in white and is generally a replacement for silicone. Eco-Bond - This is my top pick. These are all zero-VOC. I tested this much later than the others, but I can say that this is another really great caulk. At least as safe as AFM with better bonding. It comes in white and clear. It is the only zero-VOC clear caulk that I know of. They are not silicone. One person who is extremely sensitive to caulking thought Ecobond took two weeks to off-gas compared with six weeks for GE. Others might GE better than Ecobond. Everyone's experience will be a little different. (As of early 2019 this company is MIA, might be going out of business and might be back). Ecobond makes an elastomeric caulk. GE Silicone II Clear Caulk - This may a better choice for the exterior. It was not as good at one week as AFM or Ecobond. We used this on the underbelly of my house and on my windows. It is low-VOC. I find that after a couple weeks it is fine for me. Aquarium Caulk - I have read that aquarium caulk is the least toxic because fish are exposed to it and they can't handle chemicals. I tested two brands, Aquarium Silicone Caulker and one called Marina from a local pet food store, they were much more expensive than brands for home use (for no reason), and they were both the worst of the worst. So bad I would not recommend testing or using these brands. One super sensitive person preferred the Aquarium caulk Aqueon to GE and Ecobond. The best adhesive I have ever tested is AFM Safecoat Almighty Adhesive. I had absolutely no problem and no reaction to smelling it while it was wet. This was a pleasant surprise after all the other glues and silicones. Insider tip, this is the same formula as Build Secure by Chemlink. I used this to install my shower. (A whole post is devoted to the custom chemical-free shower). Liquid Nails subfloor adhesive is also well tolerated by many. Disclosure: As an Amazon Associate I earn from qualifying purchases through the Amazon links. This post does not contain sponsored content. Holy Toledo you are a brave soul! Thank you for your sacrifice and for your information. ooooh god...yeah you know how it is! not a sacrifice though...I had to do it, the builders needed answers and NOW! Corinne: Thank you so much for the specific product reviews and recommendations for MCS sufferers (like me) and builders!!! You are a brave lady for doing all that testing. I have to have two window panes installed and it has to be caulked and I couldn't find any at all. I will be able to now have those windows fixed and keep out the cold air. Hi Corinne...Did you by any chance test mastic sealant? I need to have my heating ducts inspected and sealed and they say it's required by law to use this stuff, but there must be a safer alternative. It is supposedly best because it's flexible, but it also offgases methanol, ethylene glycol, and ammonia. I fear I'd be homeless if they use it...You have so much experience with all your experimentation I thought you might know. I think I found my answer in your blog...on another post you mention RCD #6 Mastic. This is less toxic than what they would normally use? Thank you so much for all your expertise on safe construction!! You are a life saver! I agree with Frank, and I suffer mightily from MCS. I did a side-by-side simultaneous comparison between Almighty and another AFM Safecoat product vs. ECO-BOND Multi-Purpose and Kitchen-Bath-Plumbing. For me, ECO-BOND products were less offensive, both initially and after 24 and 48 hours and beyond. Both companies' products worked fine in terms of their intended use. where did you get eco-bond? I have tried to order it, repeatedly, through homedepot.com and it doesn't come. they and I have followed up with the manufacturer, who never answers the phone and doesn't return messages. very frustrating. looks like a good product but we can't keep waiting: you don't want to know how long it's been since I've had a shower! with summer coming baths just have no appeal. would like to try it but if we can't get it soon will probably go with one of the 100% silicone caulks. wondering if anyone has tried gorilla adhesive and or gorilla 100% silicone sealant/caulk? they may be newer than this article. I thought of them because I was ok with the original gorilla glue. I actually found your excellent reviews here by searching for more information on the voc content of those gorilla products. thank you for sharing your test results. Antonio, I just ordered directly from eco-bond. All the other places I checked didn't have it for sale anymore. Ecobond is certainly having some problems right now with getting orders out and with their other suppliers. This has happened before, people frequently say or think they are going out of business. I'm not sure what's happening. If you are accomplishing wood on the concrete slab attempt to find a formaldyde-free plywood. You should not put Purbond or the bamboo ply on a slab. thanks so much! will try the safe coat adhesive too! Did the EcoBond mold quickly? I've heard complaints it didn't last more than a few months.